(Pi'i Mai Kanalu) Today’s MUVE Moment is a gentle dance along straight from our sold out MUVE Exercise DVD. 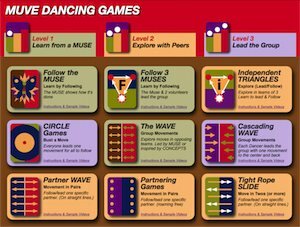 Just follow the Muse in the center, and enjoy these easy dance moves that feel good in the body and energize the spirit. MUVE can help you get up and moving at home, by using our FREE dance along blog, filled with 100s of easy to follow dance videos- dancing for fitness and joy have never been easier. https://muve.org/blog/ We move spontaneously, enjoying every beat of the music with our body. With no specific choreography, every dance move is right, MUVE is a system that is inclusive to all abilities and needs. Everyone moves to their own delight in MUVE. That means that while you are exploring the ideas you see on screen you can shape the movement to your own needs. If you want a more intense workout, you can put more energy into your moves. And likewise you can always make your movements smaller or slower. That's the beauty of MUVE, and one of the reasons all generations can dance together with MUVE. So go ahead and invite your family to join in! Many people prefer following a lead dancer. It's relaxing not to have to remember or create anything but to just flow along with the music and the movement ideas created by the MUSE (lead dancer.) That's what we call a dance-along. HI my name is Georgina Warth and I live in New Zealand.I love your video and I would love to know where I could buy it.I work with Senior and I know they will love the move too.